Fort Walton Beach, Florida is a town steeped in American history. From the Mississippian Indians who first called the beach home to the Spanish pirates who plundered its shores, the Confederate soldiers of Camp Walton to the modern day military stationed at Hurlburt Field and Eglin AFB, this place is a piece of Americana. So where better to celebrate the work of our forefathers and all that lies ahead for the land of the free? Here are our best bets for the Fourth of July in Fort Walton Beach. The City of Fort Walton Beach puts on a party at the Fort Walton Beach Landing on Brooks Street Downtown. From 4 to 9 p.m., you can enjoy food and exhibitor booths, live music and entertainment, as well as children’s activities. The City of Destin’s annual Independence Day Fireworks Show is held near Destin Harbor over the waters of East Pass beginning at 9 p.m. Turn your radio to Z96 (96.5 FM) during the show to hear the musical accompaniment. HarborWalk Village will celebrate America’s freedom for three full days, from July 2 to 4. Spirits will soar and flags will wave as the festivities kick off on Thursday with a “Red, White and Blue Celebration” honoring a local hero. On Friday, let freedom ring during a performance from the glamorous Victory Belles as they revive the WWII era singing 1940s classics. 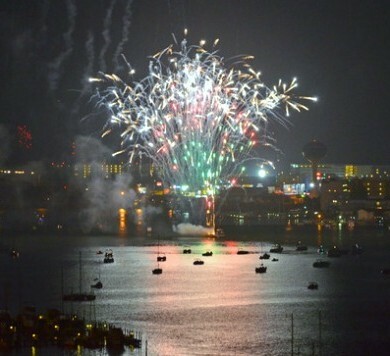 The patriotic salute will go off with a bang as fireworks light up the sky at 9 p.m.
Southern Star Dolphin Cruises will offer an hour-and-a-half cruise of the Destin Harbor anchoring in the East Pass by the fireworks barge in time for the big show. The captain tries to get as close to the barge as the Coast Guard will allow. In fact, they have historically been so close, they discovered ash on the boat when they returned to the dock! This cruise provides the closest view of the fireworks anywhere on the Destin Harbor. Purchase yours today by calling (850) 837-7741.